1. Get at least three lectures ahead in each of my classes. 2. Learn how to do flow cytometry - a cool technique that we actually do have the equipment for here. 5. Clean out the garage, and finish unpacking. 6. Read at least one novel - maybe even two. 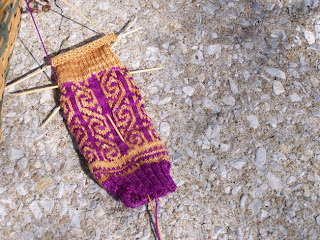 One project I hope to finish are these socks that I started back in January. For my birthday (back in Nov.) my husband gave me these two wonderful skeins of Claudia Handpaints Yarn. I started making some colorwork socks, based off a chart in Anna Zilboorg's sock book. But other than that chart, I don't have a pattern I am working from. I hope that I can figure out what I did so far on the first one so the second one will match.